Sport at the seaside: kayaking in Sardinia! Kayak hire in Cala Ginepro: enjoy watersports like never before in a kayak in Sardinia! Kayaking in Sardinia, in the Gulf of Orosei, amid the turquoise and emerald green shades of the sea...The transparency of the water and the enchanting colours of nature are sure to amaze you, and you will be in the centre of this marvellous spectacle. All of this is possible on the campsite, with our kayak hire at Cala Ginepro! On the fully equipped beach at Camping Cala Ginepro, we have single and double canoes for hire from 1 June to 30 September, to allow you to indulge in all the watersports you want to; our bathers’ assistants are always at your service to provide you with all of the relevant information. You can take part in organised excursions, suitable also for beginners who – thanks to the support provided by our instructors – can savour the unique thrill of experiencing the sea in a kayak. In summer, we also organise group canoe excursions, to allow you to discover the wonderful, pristine beaches of the Biderosa Nature Reserve. A canoe is the best way to experience the sea from a different perspective. It is the watersport that can be enjoyed by everyone, with the intensity and on the timescales that you prefer. 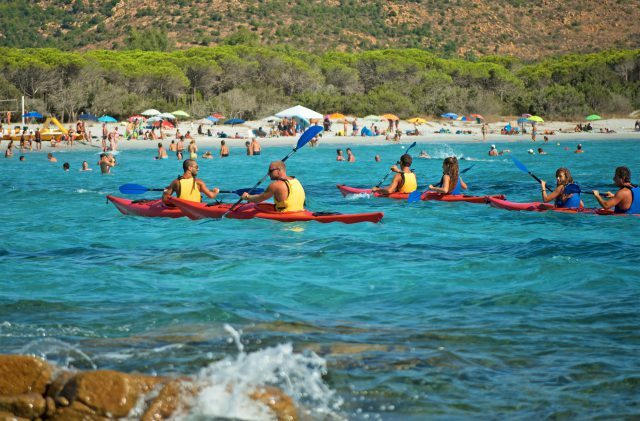 Try out kayaking in Sardinia, in the Gulf of Orosei – a truly unique experience: make the most of it at Camping Cala Ginepro! Enjoy a different side to the sea in Sardinia.